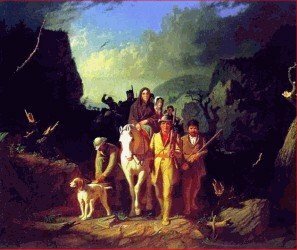 Daniel Boone was born on November 2, 1734 (October 22, old style date) to Squire Boone, a weaver who had moved to America from England twenty years earlier. Squire and his wife Sarah, who lived in Pennsylvania, were members of a religious group called Quakers. * Daniel was the sixth of eleven children in the family. Once when smallpox* was in the neighborhood Daniel's mother kept the children inside so they wouldn't get it. They were tired of being cooped up and sneaked out of the house. At a neighbor's house they deliberately exposed themselves to the disease. They caught smallpox from the neighbor children and after recovering from it were free to leave the house as usual. Their mother was quite upset about what they had done. When he was young he helped his mother on the farm. From the time he was 10 until he was 17 he was the herdsman for the cattle, taking them to roam in the woods and eat and then bringing them back in the evening. He was not able to attend school, but his mother taught him to read, spell, and write. The lad also became an expert hunter. The Quakers wanted their children to marry within their own group. When three of Squire's children married outsiders, he defended their choices, causing a rift between his family and the Quaker leaders. He left the church and moved his family to North Carolina. They traveled in covered wagons called Conestoga* wagons. It was a long hard trip. France and England were in a war over who would control this new land. The French encouraged the Indians to attack the British settlers. 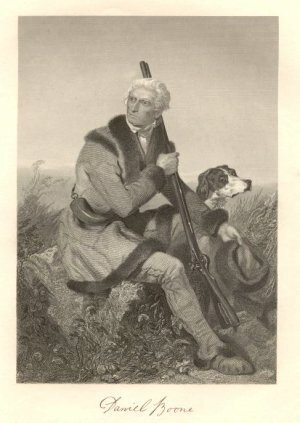 Daniel Boone, now a grown man, joined with the British and enlisted in a North Carolina unit. After eight years the British defeated the French armies, but as it turned out neither nation ruled the country because of the American Revolution. During the French and Indian War Boone was not a soldier, but drove a wagon with army supplies. In an ambush Major General Braddock lost nearly 900 men, but Boone was able to escape. Daniel married a woman named Rebecca. They had five children of their own, raised two children of relatives and adopted six children belonging to Rebecca's brother. His wife had died and he could not care for them. Rebecca was quite busy at home caring for the large family while Daniel ventured farther and farther from home searching for hunting grounds. 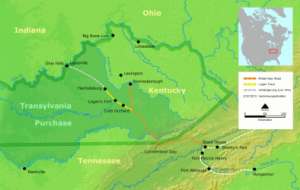 In 1767 Daniel and his oldest son James crossed the Appalachian Mountains* into the area which would become the state of Kentucky. The Indians didn't like it when the settlers began intruding on their hunting grounds. Buffalo, bear, deer, and elk were plentiful for hunting. They returned home and after a while Daniel took five men with him and they explored that area for two years. They found a gap in the mountains where it was easier to cross. It was called the Cumberland Gap. It was named for a British General, the Duke of Cumberland. This passage would later become a gateway to the west through which many settlers would pass. Besides hunting for food the men trapped animals for their valuable fur. They had prepared about 250 pounds of pelts* worth hundreds of dollars. A group of Shawnee Indians warned them to leave, attacked the camp, and stole the pelts. They also took the men's horses and left them with barely enough supplies to get back home. One day Daniel came upon an old Indian who had been deserted by his tribe to die. Boone in an act of kindness killed a deer, kept a little of it for himself, and left the remainder for the old man to eat. Boone knew Kentucky was a good land and organized fifty settlers who also wanted to move there. The Indians attacked and killed six of the group. James, Daniel's son, was one of the casualties. The settlers returned to Virginia. Boone once said he had killed three Indians in his lifetime and then only in self-defense. The Virginia militia fought the Indians and eventually the Shawnee were forced to agree to a treaty. Richard Henderson, a lawyer and a judge sponsored Boone's exploration. He was the man who hired him to build the Wilderness Road. 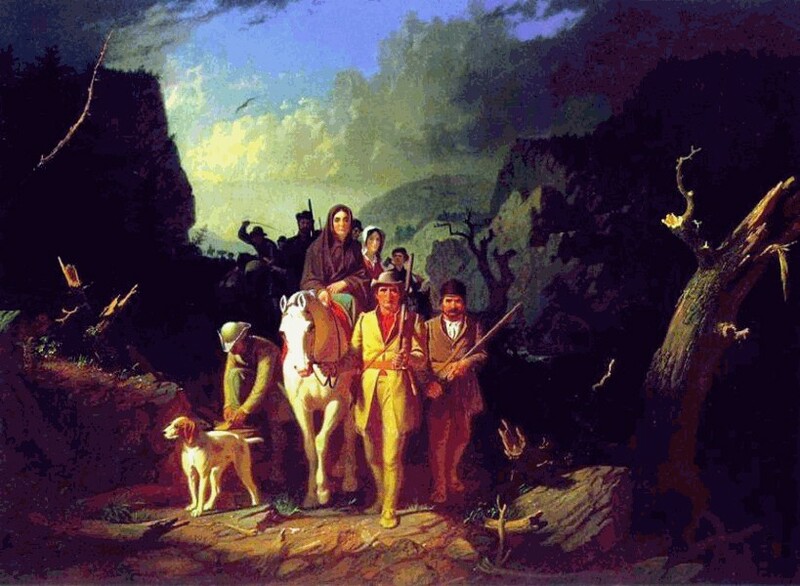 It was 1775 and Boone led a group of twenty-eight men to make a road from Virginia to Kentucky. Boone made it possible for Henderson to buy 90,000 square miles of land in Kentucky from the Cherokee, and Henderson granted Boone 2,000 acres. Later Daniel's land claims were disputed and he had to sell all his land to pay off his debts. When they reached the Kentucky River they built a group of log huts and called the town Boonesborough. The town was made into a fort. Boone moved his family there. In 1776 his thirteen-year-old daughter Jemima and two of her friends were kidnapped by the Indians. After two days her father and four other men rescued them. In August a message was delivered to the people of the town. It was the Declaration of Independence. The people of the United States wanted to be free of English rule. The British encouraged the Indians to attack the settlers. Boone was almost killed in one of the attacks. Once when he and a group of men were away from the fort harvesting salt, they were captured by the Shawnee Indians. He lived with the Indians for six months. Black Fish adopted him and called him "my son". He gave Daniel the name Shel-Tow-Y which means "The Big Turtle". The twenty-seven men were sold and Boone finally managed to escape. The hostilities continued until the Revolutionary War was won by the United States of America. Without British support the Indians moved north. Boone became a leader in the government. He was elected to the Virginia State Assembly in 1780. Boone kept moving his family. He eventually moved out of the United States to an area controlled by Spain where they appointed him to be a local leader. In exchange for 850 acres of land he had led a group of settlers to the new land. Rebecca his wife died and seven years later Daniel Boone also died at the age of eighty-five. This biography by Patsy Stevens, a retired teacher, was written February 4, 2011. How Do We Get Salt Out of Water to Use for Food? This page displayed 75,868 times.